This is a mid century modern tall dresser armoire. It has 2 beautiful sculpted doors, five dovetailed drawers, and a splayed leg design. It has lots of storage space. Dimensions: 42″W x 19″D x 52.5″H. This is a pair of mid century modern Danish chairs that has solid wood frames with curved spindle backs, and splayed legs. Dimensions: seat width: 18″, seat depth: 17.5″, seat height: 17″, back height: 28.5″. This is a mid century modern nightstand with splayed brass legs, brass handle, and 2 dovetailed drawers. The top drawer has a cool cubed parquet design. We think it looks like a mini robot. Dimensions: 20″W x 16″D x 26″H. This is a mid century modern glass topped coffee table and matching side end table. Both tables have a glass inserted top, and splayed leg design. The coffee table has a bottom shelf. Coffee table: 47″W x 20″D x 15.5″H. Side end table: 29″W x 17.5″D x 21″H. These are 2 mid century modern chairs with solid wood frames and a splayed leg design. The first chair has a slatted back, and contoured seat. Dimensions: seat width: 15.5″, seat depth: 17.5″, seat height: 18.5“, back height: 32″. The second chair has a curved spindle back. Dimensions: seat width: 19.5″, seat depth: 17″, seat height: 17“, back height: 28″. This is a mid century modern side end table with a guitar pick design. It has a floating glass top, with an undulating solid wood base with splayed legs. Dimensions: Top: 24.5″W x 24″D x 21.5″H, Bottom: 30″W x 29″D x 15″H. This is a mid century modern tall dresser that 4 dovetailed drawers with a cool convex design, sculpted brass handles, and splayed tapered legs. Dimensions: 36″W x 19″D x 44″H. This is a mid century modern console table with a splayed tapered leg design, surfboard top, 1 floating dovetailed drawer, and bottom shelf. Dimensions: 48″W x 16″D x 25″H. This is mid century modern coffee table by Willett in solid cherry. It has a beautiful asymmetrical design with splayed legs, 3 dovetailed drawers, and a glass top that shows off a slanted magazine rack and shelf. Dimensions: 48″W x 21″D x 18″H. This is a mid century modern solid wood kidney side end table with splayed tapered legs. Dimensions: 26.5″W x 18″D x 16″H. This is a mid century modern china cabinet hutch that has 2 dovetailed drawers,and 2 side cabinets with a streamlined design and brass handles. The top hutch has solid wood shelves and a glass door. The base has beautiful splayed legs. Dimensions: 48″W, 12″D (top), 15″D (bottom), 64″ overall height. This is a mid century modern Danish style book shelf with a gorgeous angled design and splayed tapered brass tipped legs. They are a smaller size, great for compact spaces that need a perfect little accent piece. (Books pictured are not included.) Dimensions: 26″W x 8″D x 27.5″H. This is a mid century modern shelf unit by Mastercraft. It has record storage slats on both sides of the sliding door bottom cabinet, and splayed legs. Dimensions: 36″ W x 16.5″ D x 35″ H.
This is a mid century modern coffee table by John Stuart, made in Britain. It has an asymmetrical design, 3 splayed legs, and a hidden drawer. Dimensions: 40.5″W x 18″D x 17.5″H. This is a mid century modern cedar chest trunk by Lane. 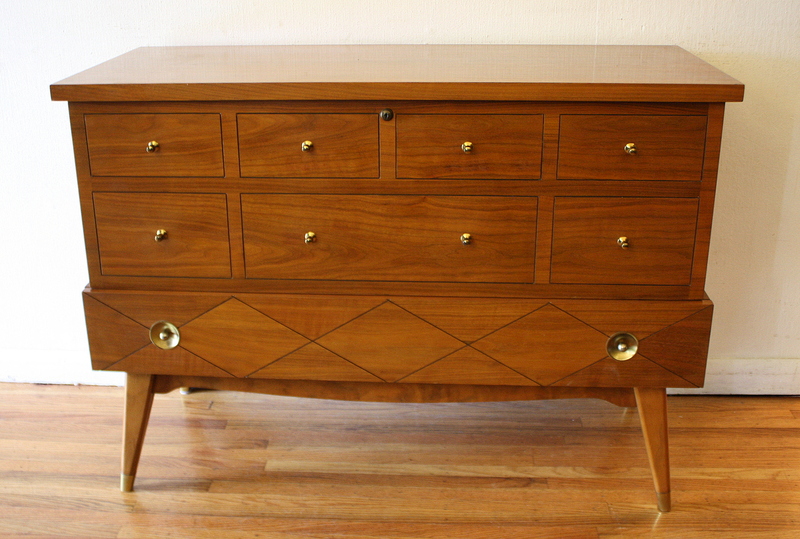 It is console height, has decorative brass knobs, 1 dovetailed drawer with brass pulls, and splayed legs. Dimensions: 43″W x 16.5″D x 20″H.